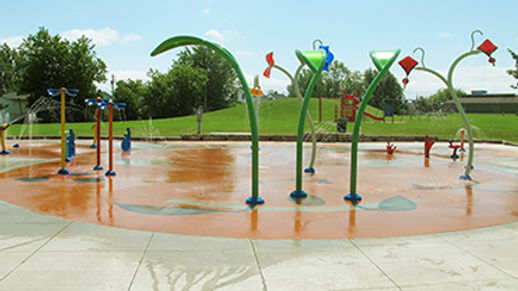 There are several parks and more than 40 playgrounds in the City of Moncton. You can check them all out on great City-produced map, which easily identifies which have summer programming, water features, and more. We’ve picked a few to highlight here. 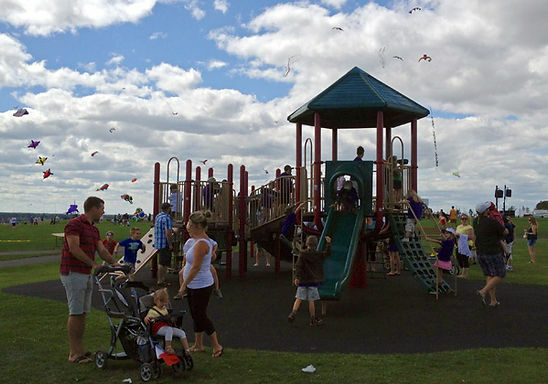 The go-to park for most families in Moncton is Centennial Park (811 St. George Boulevard). There’s a large, wheelchair-accessible playground and a SuperSplash Park at the main entrance. A new natural playground by Bienenstock Playgrounds opened in June. For summer days, there’s Kiwanis Centennial Beach (pay-to-swim), which boasts fine sand, change rooms, a canteen, and lifeguards. For older kids there’s TreeGo (ages 7 to 13), tennis courts, and lawn bowling. There are also several trails, a duck pond, and a dog park. If you’ve got some change in your pocket, consider heading to the Magnetic Hill Zoo and checking out the tallest playground in Atlantic Canada — with seven slides and lots of climbing opportunities for all ages! There’s a smaller section suitable for the youngest visitors. The tallest playground in Atlantic Canada, at the Magnetic Hill Zoo. Allison Heights Park (1535 Salisbury Road) is a family favourite. Lots of parking, but the playground itself is tucked just a little ways back into the shelter of some trees. It’s a wonderful place to go if you’re worried about toddlers who like to bolt — I’ve gone solo with my three kids, had the place to ourselves, and never once had to worry about being near traffic. There’s lots of equipment, suitable for various ages, and you can also make use of the basketball court. The Lewisville Y Park (45 Glenmoor Drive) is about three acres, with a play structure, monkey bars, a slide, tennis courts, a basketball court, and a splash pad. Parking is only on the street; there are benches and a picnic shelter. Climbing the walls at home? Take the kids to Savannah Heights Park (121 Savannah Drive) and let them climb there! The playground has swings, a play structure, and a climbing wall, along with several benches and a small walking trail. Just interested in splash pads and parks? Check out our list of where to get wet this summer! The Town of Riverview shows more than two dozen parks on its map. Four of these are ‘tot lots,’ geared towards those under age 5; these are found on Irving, Brewster, Belfast, and Miles Streets. Be sure to make a visit to the Rebecca Play Area, a park with lots of adventure and charm. 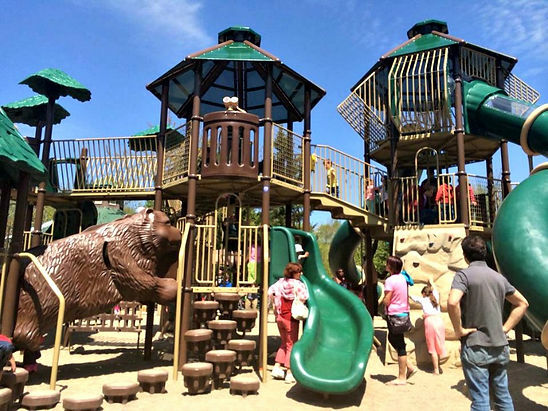 Opened in July 2014, the park mixes natural elements and traditional equipment, boasting a double hillside slide, tunnels, and an accessible swing set. 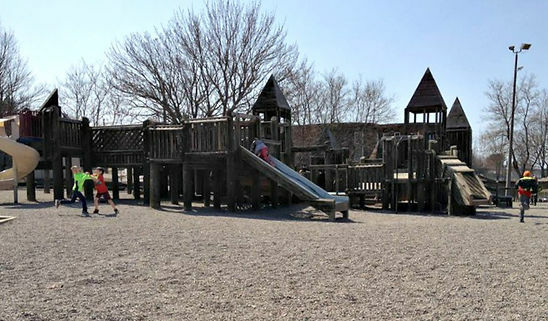 The town’s only accessible playground is Patricia Park, found on Cleveland Avenue across from Riverview Middle School and Frank L. Bowser Elementary. On the other side of the schools, along Pine Glen Road, you’ll find the crowd favourite All World Super Play Park. Also sometimes called the Wooden Park or the Castle Park, it’s a great space to let kids run and explore. The park is used by school students, so you should plan accordingly. The City of Dieppe lists two dozen neighbourhood parks and green spaces; the locations are shown on this map. Rotary St-Anselme Park (505 Melanson Road) is one of the main year-round parks in Dieppe. It includes an accessible playground, a picnic area, a BMX track, and walking and biking trails (check out this map for distances and difficultly level). Codiac Transpo stops here; there is also lots of parking. The other main multi-use park in Dieppe is Dover Park (337 Dover Road). There is a lovely playground, as well as picnic tables, exercise stations, soccer fields, and trails for cycling, rollerblading, and walking. The park has lots of parking and is accessible via Codiac Transpo. If you’re looking to get moving but don’t need a playground, check out Mapleton Park (600 Mapleton Road). There is 300 acres of trails, with washrooms, bird watching, ducks, and more. Walk, run, or bike the trails. You could also head to Irishtown Nature Park, which has trails running through more than 2,000 acres. On Saturday afternoons in July and August, join a nature interpreter for a walk through the park geared toward kids and families. And don’t forget Riverfront Park and the TransCanada Trail, a wonderful walking/biking/running/rolling pathway that connects Moncton, Dieppe, and Riverview. Along the trail you can watch the Tidal Bore, visit Treitz House, check out the Skateboard Park, as well as find several spots to sit and reflect. For an easy way to search parks in the Greater Moncton area, check out Just Park It. This local website allows you to search out parks by entering your postal code or searching for specific details, such as toddler friendly, wheelchair accessible, slides vs. swing, and much more. What’s your family’s favourite playground destination? What hidden gem are you willing to share? Let us know where to play next!